The Stanley Cup Final between the Caps and Golden Knights has also been a battle off the ice through the first three games of the series and that battle is set to continue in Game 4. Saturday night, Washington countered Vegas bringing in Michael Buffer to announce the starting lineups ahead of Game 1 with 'Wheel of Fortune' host Pat Sajak and for Game 4 Monday night, the band Fall Out Boy will be rocking the stage outside of the arena. Washington’s answer to Vegas's Stanley Cup pregame festivities? 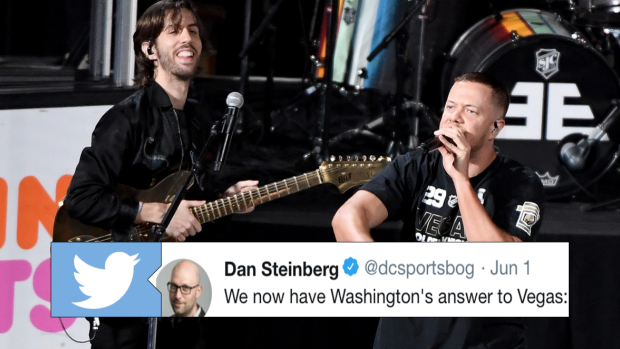 The Capitals probably would never admit it, but having Fall Out Boy perform ahead of Game 4 seems like it's a direct response to the band Imagine Dragons playing before puck drop of Game 2. Like we said before, the Stanley Cup Final has been a battle on and off the ice and you can bet the Golden Knights are already planning something huge for Game 5.